Government and private sector employees that subscribe to Provident Fund can easily check how much money is accumulated in their accounts. In addition Employees Provident Fund Organization (EPFO) now deploys modern technologies that enables you to check your PF balance as well as know your Provident Fund claim status. Before you claim money from a Provident Fund account, it is vital to know the balance. Therefore I will first explain various ways and means provided by EPFO to check PF balance online & offline. Most importantly remember, you will need to get some things ready before you check PF balance. Upon getting these things ready, you can proceed for the online & offline method to check PF balance. Universal Account Number or UAN provided by EPFO is vital to check your PF balance using UAN and track PF claim status. Simply getting a UAN is not sufficient, you need to activate the same by visiting EPFO portal or the nearest EPFO office. Without activated UAN, you cannot enquire PF balance or track PF claim status. If you have an inactive UAN, ensure it is activated immediately. You can activate UAN through the EPFO portal. There are four distinct and simple ways to check PF balance online & offline. These methods are hassle free and can save time, money and effort you would otherwise spend on visiting the nearest EPFO office or inquiring with employer. You can check PF balance by simply sending an SMS to EPFO’s special mobile number: 7738299899. The SMS you send should read like this <EPFOHO UAN ENG>. All letters need to be uppercase, if you want to check PF balance in English. Subsequently, I will explain the format of this message further. The first six letters, EPFOHO remain the same for everyone. After single space, fill in your Universal Account Number or UAN. You have to key in the language in which you want to check PF balance by SMS after single space following the UAN number. Use ENG if you want to inquire in English. For Hindi, use HIN, Marathi- MAR and so on. It is now possible check PF balance in English, Hindi, Kannada, Punjabi, Marathi, Gujarati, Tamil, Telugu, Malayalam and Bangla. EPF have added more languages. You will receive an SMS message from EPFO indicating your latest PF balance. To use this facility, there are some basic requirements. The PF account has to be linked with your Aadhaar card. Mobile number should be the same which you have given at the time of Aadhaar registration or updated later. Your mobile number should be recorded with EPFO and linked to your Provident Fund account. The facility to check PF balance by SMS cannot be used from any mobile number, even if you have the UAN. Hence, ensure you use the same number that is registered with EPFO. Repeated attempts to check PF balance by SMS using another mobile number will fail automatically. After several failed attempts, EPFO can temporarily block your SMS facility to check PF balance as a fraud prevention measure. Remember, it can take several minutes or even a couple of hour for a response from EPFO indicating your PF balance. This depends upon traffic to the EPFO mobile number and PF balance check system. Sending repeated messages will only delay the response. You can also check PF balance by giving a missed call to 011-22901406. Before utilizing the missed call facility to check PF balance, here are basic guidelines. The missed call should be made from the same mobile phone number that is recorded in your Provident Fund account by EPFO. Your Provident Fund account should be fully compliant with existing Know Your Customer regulations, meaning linked with your Aadhar card and PAN. The mobile number used to place the missed call should be same one registered with Unique Identification Development Authority of India (UIDAI) at the time of applying for Aadhar or updated and verified later. Missed call to 011-22901406 cannot be made from a landline telephone or any other mobile phone number. Never place repeated missed calls to this number: it can cause the facility to check PF balance being temporarily blocked as fraud prevention measure. The call to 011-22901406 gets automatically disconnected. You will receive a SMS message after some time. At times, this SMS can take a few minutes or even a couple of hours to arrive on your mobile phone. This too depends upon traffic to EPFO’s balance enquiry systems. UMANG means Unified Mobile Application for New Age Governance. It is a smartphone app that can be downloaded free. This app is provided by Ministry of Electronics and Information Technology (MeitY). It is reliable and safe to use. Download UMANG app on your smartphone. Activate the app after providing necessary details. Go to the EPFO link provided on the app. Click on ‘Employee Centric Services’. Upon filling the UAN number, you will receive a One Time Password (OTP) through SMS on your mobile. Key in this OTP and view your e-passbook to check PF balance. While using UMANG app too, you need to follow the same procedures. This means, your mobile number should be linked to the Provident Fund account. It has to be the same number that reflects on your Aadhaar card and PAN details. This is vital to receive the OTP since EPFO system will send the SMS only on your registered mobile number. If you do not have Aadhaar card, PAN or mobile number, it is still possible to check PF balance online. Access the EPFO portal from any computer. Visit the EPFO portal and click on ‘e-Passbook’ link that appears on right side of the page. Upon clicking this link, you have to submit your UAN. Next steps is to complete the Captcha code and submit. The EPFO portal has the following instructions if you want to check PF balance. This facility is to view the e-passbook, PF subscribers have to be registered on the EPFO Unified Member Portal. E-Passbook will be available after six hours of registration at Unified Member Portal. Changes in the credentials at Unified Member Portal will be effective at this Portal after six hours. Passbook will have the entries which have been reuniting at the EPFO field offices. Passbook facility will not be available for exempted establishment members, settled members and inoperative members. There are several apps provided by private parties to check PF balance. These are not authorized by the Indian government. Nor are they endorsed by EPFO. Using them can cause your vital details such as UAN number and other information to fall in hands of unscrupulous persons. These details can be used to hack your PF account or perpetrate frauds. It is therefore best to avoid these apps, though they come with fancy logos and carry official sounding details about services provided. Remember, PF is your security for future. A Provident Fund account will provide you money after you retire from active service, especially after the age of 58 years. You can lose the money and security it offers, should UAN and other essential details leak into wrong hands. Now that you are aware how to check PF balance, it is very easy to find the status of Provident Fund claim. UMANG app provides the easiest way to check PF claim status. 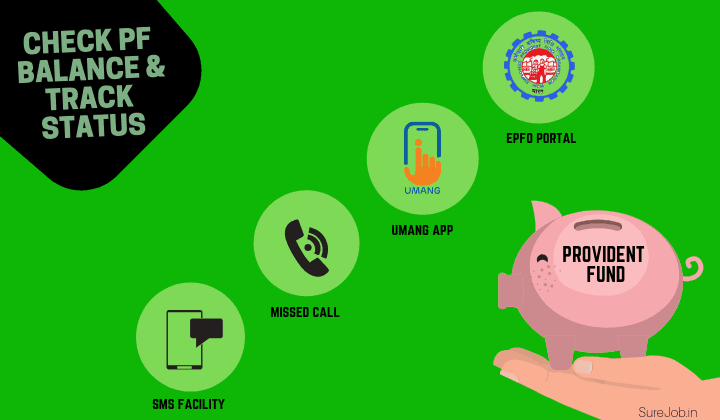 Click on the EPFO link on your UMANG app. You will find several services. Under this section, you will find a link ‘Track Claim’. Fill in the OTP sent by EPFO by SMS. Once you have completed these steps, the app will display your PF claim status. Remember, your PF account has to be linked with the mobile number from where you will access UMANG. This is vital for receiving the OTP to check PF claim status. If your Provident Fund account is not linked to the mobile phone number or is not fully compliant with KYC, you can still check PF claim status. Visit the EPFO portal and select ‘Online Claims/ Member Account Transfer’ link on right side of the page. Fill in your UAN number. Complete the Captcha code and press Submit. Upon completing this process, the EPFO portal will display your PF claim status. While checking PF claim status through UMANG or EPFO portal, it is important to ensure you have submitted the required forms and you are eligible to receive the money. Allow at least one week for EPFO to update your claim status. Updating your status takes time since there can be several claims. Hence, patience is necessary. You can check the status again after three days. This gives sufficient time to get proper information. UAN is mandatory for all online transactions including balance enquiry and tracking claims. Before checking PF balance and claim status, ensure you have all the necessary details ready. This also includes PF membership details of your past or current employer. There are some provisions to circumvent a past employer’s details, if you have strained relations. EPFO provides several methods to seed your PF account with Aadhaar and PAN. Getting your PF account full KYC compliant is the first step towards checking balance and laying claim. This would also include updating your mobile number in UIDAI database since EPFO uses Aadhaar based verification of your credentials. If you are using mobile number other than one given at the time of Aadhar registration, I suggest you get the new number updated immediately by visiting any Aadhar registration center. You can also check if your number exists in UIDAI database by visiting their portal. Active UAN is necessary. If you have proper details, checking PF balance and track PF claim status is very easy. Next articleHow to Choose the Best Digital Marketing Course & Training?